© Murray et al. ; Licensee Bentham Open. 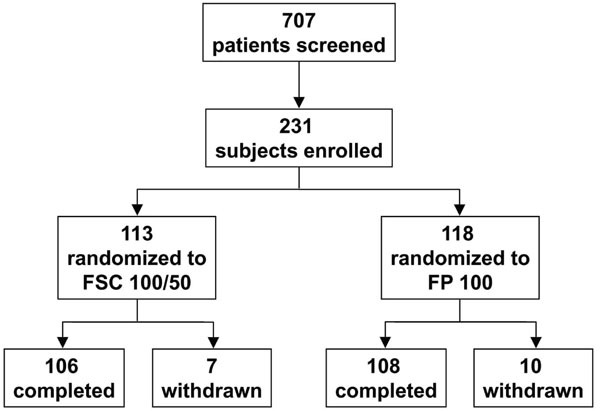 This study was designed to demonstrate that four weeks of fluticasone propionate (FP) 100 micrograms (mcg) combined with salmeterol 50 mcg twice daily (BID) via DISKUS® resulted in protection against bronchospasm induced by activity, as measured by standardized exercise challenge testing in pediatric and adolescent subjects who required regular use of inhaled corticosteroids for the treatment of persistent asthma. Prior to study entry, all patients reported regular use of inhaled corticosteroids (ICS). During screening all patients demonstrated ≥20% fall in FEV1 following exercise. A total of 231 subjects aged 4 to 17 were randomized to the two study treatments: 113 to the FP/salmeterol combination group (FSC) and 118 to receive FP 100 mcg BID. Of the subjects randomized, 106 (94%) subjects in the FSC 100/50 group and 108 (92%) subjects in the FP 100 group completed the study. At the end of treatment (Week 4), both FSC and FP protected against a fall in FEV1 following exercise in patients who at baseline experienced ≥20% fall in FEV1 following exercise. 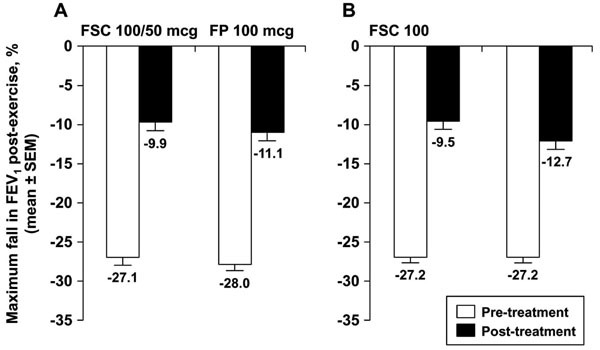 A mean decrease in FEV1 of 9.9% was observed in the FSC 100/50 group as compared with a mean decrease of 11.1% in the FP 100 group; there was no statistical difference between treatments. Both FSC 100/50 and FP 100 provided protection against an exercised-induced fall in FEV1; but statistically significant differences we not noted. Both treatments were well-tolerated over four weeks and FSC 100/50 had an adverse event profile comparable to that observed with FP 100. Keywords: Fluticasone propionate, salmeterol, asthma, exercise challenge..
Current asthma treatment guidelines by the National Institutes of Health recommend the use of inhaled corticosteroids (ICS) as the preferred treatment in children and adults with persistent asthma who remain symptomatic despite the use of regular or as-needed short-acting beta2-agonist monotherapy . For many patients with symptomatic asthma, it is not uncommon for physical exertion to be the initial or only precipitating factor for acute symptoms of asthma. For example, it has been estimated that exercise is a trigger for acute bronchoconstriction in approximately 70% to 80% of patients with clinically diagnosed asthma . And since it can occur in patients who otherwise have minimal or no asthma symptoms, exercise-induced asthma (EIA) or exercise-induced bronchospasm (EIB) is often managed as a discrete entity. For these types of patients, salmeterol has been shown to be effective in protection against EIB for up to 12 hours [3, 4]. However, in patients who also have symptoms of persistent asthma, exercise or other forms of activity may represent only one of many stimuli or triggers that lead to worsening symptoms. Controller medications that improve the overall control of asthma in subjects with persistent asthma may also prevent or reduce asthma symptoms associated with daily physical activity or exercise. In this regard, chronic treatment with ICS has been shown to reduce the severity of exercise-induced asthma symptoms [5, 6]. Similarly, the use of fluticasone propionate (FP) 100 micrograms (mcg) in combination with salmeterol 50 mcg has been shown to be effective in both improving asthma control and reducing asthma symptoms induced by activity in patients age 12 years and older [7, 8]. There are little data available comparing the FP/salmeterol combination (FSC) product with FP alone, with respect to the ability to attenuate symptoms of asthma that are triggered by activity in pediatric and adolescent patients with persistent asthma. Therefore, this study, using standardized exercise challenge tests, evaluated the efficacy of regular use of the FSC 100/50 mcg twice daily (BID) compared with FP 100 mcg BID for the prevention of bronchospasm triggered by activity in pediatric and adolescent subjects with persistent asthma who also experience activity-induced bronchospasm. This study was a four-week, randomized, double-blind, parallel group, multi-center clinical trial (SFA100316). The protocol and subject consent forms were approved by the respective Institutional Review Boards at all participating investigative sites and conducted in compliance with Good Clinical Practices. The study was identical to a duplicate study and detailed inclusion/exclusion criteria, methods and procedures, including exercise challenge and serial forced expiratory volume in once second (FEV1), have been previously reported . To demonstrate that FSC 100/50 mcg BID provided long-term protection against bronchospasm induced by activity in pediatric and adolescent subjects with persistent asthma and who also experienced activity-induced bronchospasm. 1) Age 4-17 years of age; 2) Diagnosis of persistent asthma treated with daily ICS for at least four weeks; 3) FEV1 of 70 to 95% of predicted based on Polgar predicted normal values ; 4) Decrease in FEV1 of at least 15% after exercise challenge. 1) history of life-threatening asthma; asthma hospitalization within six months of screening; 2) significant concurrent diseases, including a recent respiratory tract infection (within four weeks prior to screening); 3) pregnancy and/or lactation; 4) use of oral or parenteral corticosteroids within four weeks of screening or two courses of oral or parenteral corticosteroids within six months of screening; 5) use of the following medications within two weeks prior to screening and throughout the study: inhaled cromolyn, nedocromil, leukotriene modifiers, long-acting beta2-agonists, theophylline products, and inhaled anticholinergics. The primary measure of efficacy was maximal percent fall in FEV1 following exercise challenge. The secondary measure of efficacy was 4-hour serial post-dose FEV1 AUC on Treatment Day 1. Related efficacy measures included morning (AM) peak expiratory flow (PEF), evening (PM) PEF, percent of rescue-free days, and percent of symptom-free days. Upon study entry, subjects were switched from their pre-study ICS to FP 100 mcg BID (Flovent DISKUS, GlaxoSmithKline, Research Triangle Park, North Carolina) and had to maintain their FEV1 at 70-95%. To be randomized to treatment, subjects were required to have documented albuterol use and/or asthma symptoms during the seven days immediately prior to the study visit, while receiving FP 100 mcg BID. Electronic diary devices were used to record daytime and nighttime asthma symptoms on a 0- to 5-point Likert scale: 0 represented no symptoms and 5 represented severe symptoms. Subjects also recorded AM and PM PEF (best of three attempts) and albuterol (Ventolin HFA, GlaxoSmithKline, Research Triangle Park, North Carolina; albuterol HFA, IVAX, Miami, Florida) used for relief of asthma symptoms. A minimum 20% fall in baseline FEV1 following exercise challenge was also required at the end of the run-in period, as recommended by the Food and Drug Administration’s Draft Guidance for Industry Exercise-Induced Bronchospasm (EIB)- Development of Drugs to Prevent EIB . Subjects meeting both asthma symptom and exercise challenge randomization criteria were assigned to receive one of the following treatments for four weeks in double-blind fashion: FSC 100/50 mcg BID or FP 100 mcg BID via the DISKUS device. Serial FEV1 was measured in the clinic over four hours following the first dose of study medication, and exercise challenges were repeated after four weeks of treatment. The exercise challenge, which followed a widely accepted and validated approach, consisted of running on a treadmill and determining the speed and incline of the treadmill that allowed the subject's heart rate to reach ≥80% of maximum based upon their age . Heart rate was monitored continuously throughout the exercise challenge and room temperature was maintained between 20 to 25 degrees Celsius (68 to 77 degrees Fahrenheit). To control for effects of temperature and humidity during exercise, subjects inspired compressed air from a balloon-reservoir bag fitted with a two-way, non-rebreathing valve and a mouthpiece or face mask. The treadmill incline did not exceed 15%, and subjects were required to refrain from holding onto the support railings during the exercise challenge. Subjects exercised for approximately two minutes under minimal conditions (Step I), approximately two more minutes under more strenuous conditions (Step II), and then six minutes under the target conditions (Step III). Progression between steps was contingent upon the absence of cardiovascular and pulmonary signs and symptoms. Step III was stopped prior to the full six minutes if asthma symptoms were considered severe enough to warrant discontinuation of exercising. The heart rate recovery time, defined as the time required to return within 5% of the pre-exercise FEV1 from the time of the maximal fall in FEV1 post-exercise was also collected during exercise challenge. It was estimated that 103 patients per treatment arm would provide 90% power to detect a difference of 5 percentage points in the maximal percent fall in FEV1 between the two treatments. The maximal percent fall in FEV1 was calculated as the percent change from pre-exercise FEV1 to the minimum FEV1 collected within one hour following exercise challenge. The primary population for all statistical analyses was the intent-to-treat (ITT) population. The ITT population consisted of all patients who were randomized to study drug. All statistical tests tested a two-sided hypothesis of no difference between treatment groups at a significance level of 0.05. An analysis of covariance (ANCOVA) model, (SAS version. 8.2, SAS Institute, Cary, North Carolina) including terms for treatment, pooled investigator, age stratum, and baseline, was used to test statistical differences between treatment groups for the FEV1 and diary measures. The protocol and subject consent forms were approved by the respective Institutional Review Boards at all participating sites and conducted in compliance with Good Clinical Practice. Written informed consent was obtained from each subject’s parent and/or legal guardian prior to enrollment and before conduct of any study procedures. Patients screened for the study reported using ICS for at least 28 days prior to screening at a daily dosage of no more than: 264 mcg of FP metered-dose inhaler (MDI), 600 mcg of budesonide, 504 mcg of beclomethasone dipropionate, 1000 mcg of flunisolide, or 1000 mcg of triamcinolone acetonide. A total of 707 subjects were screened for the study; the majority of screen failures were due to inability to demonstrate the required drop of FEV1 following exercise challenge. A total of 231 subjects were randomized to the two study treatments: 113 to the FSC 100/50 group and 118 to FP 100. Of those randomized, 106 (94%) subjects in the FSC 100/50 group and 108 (92%) subjects in the FP 100 group completed the study (Fig. 1). Baseline demographics were similar between the two treatment groups (Table 1). Pulmonary function, including FEV1, FEV1 % predicted, % reversibility, PEF, PEF % predicted, and ICS total daily dose were comparable as well. Gender and Ethnic Origin expressed as %; all other data expressed as mean ± standard deviation. Statistical testing was not performed on baseline characteristics. Data expressed as number (% of total). Data expressed as mean ± standard deviation for FEV1 measures. All others are mean ± SEM. Maximum fall in FEV1 post-exercise data expressed as mean ± standard error of the mean. Data expressed as mean ± standard error of the mean. Seven (6%) and ten (8%) subjects were discontinued in the FSC 100/50 and FP 100 groups, respectively (Table 2). Reasons for discontinuation included adverse event, consent withdrawn, lost to follow up, protocol violation, and asthma exacerbation. Treatment compliance was assessed only during the treatment period according to the drug accountability conducted by the site personnel at each visit. Compliance with study medication was high and was similar across both groups. For the FSC 100/50 group compliance was 95.9% and the FP 100 group was 96.7%. Pre-exercise challenge FEV1 values were 2.27 ± 0.073 liters (L) for FSC 100/50 and 2.24 ± 0.077 L for FP 100. No significant difference in the mean maximal percent fall in FEV1 was observed between treatment groups during the exercise challenge test conducted at Treatment Week 4 (Fig. 2). The decrease in FEV1 observed was 9.9 ± 1.01% (mean ± standard error of the mean [SEM]) in the FSC 100/50 group compared with a decrease of 11.1 ± 1.02% in the FP 100 group. Post-challenge these values fell to 2.02 ± 0.064 and 1.99 ± 0.071 L for FSC 100/50 and FP 100, respectively. Over the four-week treatment period, there were no significant changes in the AM or PM PEFs, or percentages of rescue free- or symptom-free days or 4-hour post-dose FEV1 between the groups. For AM PEF, a mean increase of 23.7 ± 3.95 liters (L)/minute was seen compared to 14.2 ± 4.45 L/minute for the FP 100 group. Increases of 14.3 ± 3.44 L/minute and 6.2 ± 3.70 L/minute were observed in PM PEF for the FSC 100/50 and FP 100 groups, respectively. For percentage of rescue-free days (days without inhaled albuterol treatment), a greater increase was seen in the FP 100 group at 19.1 ± 3.92% compared to 16.9 ± 3.23% for the FSC 100/50 group. Similarly, the increase in percentage of symptom-free days favored FP 100 at 18.6 ± 4.11%, compared to 10.9 ± 3.19% for FSC 100/50. FEV1 AUC over 4 hours on Treatment Day 1 was greater in the FSC 100/50 group (0.72 ± 0.08 L/hr) compared to the FP 100 group (0.26 ± 0.05 L/hr). Comparison of treatment differences for all secondary endpoints was contingent upon obtaining a significant treatment difference for the primary measure of mean maximal percent fall in FEV1 following exercise challenge at Treatment Week 4. Since a significant treatment difference was not observed for the primary endpoint, all comparisons for the secondary measures were not considered statistically significant (Table 3). Other measures of efficacy included the evaluation of a categorical treatment response evaluating the percentage of subjects who demonstrated a fall in FEV1 of <10%, a 10% to <20%, and a ≥20% following exercise challenge (Table 4). At Week 4, the categorical treatment response for the exercise challenge test was similar between treatment groups. A total of 88 (88%) subjects in the FSC group had a <20% fall in FEV1 following the exercise challenge test, compared with 82 (81%) subjects in the FP group. A total of 12 (12%) subjects in the FSC group had a ≥20% fall in FEV1 following the exercise challenge test compared with 19 (19%) subjects in the FP group. The heart rate recovery time for FSC 100/50 and FP 100 were 31.4 ± 2.60 (mean ± SEM) minutes and 30.8 ± 2.36 minutes at screening and 31.1 ± 2.25 and 31.9 ± 2.33 minutes pre-randomization, respectively (Table 5). In contrast, recovery times were shorter after 4 weeks of treatment at 14.5 ± 2.16 minutes and 12.7 ± 1.88 minutes for FSC 100/50 and FP 100, respectively (difference between treatments not significant, p=0.829). Both treatments were well-tolerated and the incidence of adverse events (AEs) was similar across groups (n=20 or 18% for FSC 100/50 and 25 or 21% for FP 100). The most common AEs were headache (11 total: 6 and 5 in subjects receiving FSC 100/50 and FP 100, respectively) and upper respiratory infection (5 total: 3 in FSC 100/50 group and 2 in the FP 100 group). Drug-related AEs were also comparable and infrequent (1 or <1% for FSC 100/50 and 3 or 3% for FP 100). No individual AE considered to be drug-related exceeded 3% of the population. One subject in each group was withdrawn due to AEs, neither of which were deemed drug-related by the investigator. There were no serious AEs or fatal events. Three asthma exacerbations occurred during double-blind treatment (two in the FSC 100/50 group and one in the FP 100 group); all were either mild or moderate as determined by the investigator and all resolved by the end of the study. In this four-week, randomized, double-blind, parallel group, multi-center clinical trial utilizing exercise challenge, which followed a widely accepted and validated approach, both FSC 100/50 and FP 100 attenuated the fall in FEV1 after exercise challenge. A statistical difference was not observed when the mean maximal percent falls between treatments were analyzed (p=0.158), unlike in the identically-designed replicate study reported by Pearlman and colleagues  (Fig. 3). Results of this study demonstrated a statistically significant difference between FSC 100/50 and FP 100 in a similar population (p=0.021). The results of the current study highlight the potential difficulties that can be encountered in studies examining exercise- or activity-induced bronchoconstriction. One of these is the influence of study design when interpreting the clinical response to exercise. In our study, FSC was the test medication and FP served as the active control. Prior to randomization to study drug, all patients completed a two- to five-week run-in on open label FP and at the end of the run-in period, had to demonstrate a fall ≥20% in FEV1 following an exercise challenge. At least two weeks prior, while on open label ICS, subjects had to demonstrate ≥15% fall in FEV1 following an exercise challenge. The rationale for this approach was to ensure that the study population was familiar with methodology used during an exercise challenge and to ensure that ICS alone did not adequately control asthma symptoms triggered by standardized exercise challenge. Previous studies have shown that ICS alone can attenuate the fall in FEV1 post exercise after a single dose [13,14] and that the effect attained by ICS plateaus after approximately two weeks of treatment and is relatively unchanged with further chronic dosing [6, 15-17]. Thus, the active control FP group was expected to demonstrate a similar decrease in FEV1 post-exercise challenge after four additional weeks of randomized treatment to ICS (FP) as was seen immediately prior to randomization while receiving the same dose of open-label FP. The exact reason for the unexpected protective response to exercise following FP treatment during the study period remains unclear. It is possible that variation in the exercise load between exercise challenges contributed to the results. In exercise challenge studies of children and adolescents with asthma, Carlsen et al. reported mean maximum falls in FEV1 of 8.8% and 25.1% when the exercise load was 85% and 95%, respectively, of the calculated heart rate maximum . Thus, a slight shift in the exercise load can dramatically shift the FEV1 response to exercise, and reduced efforts could account for diminished falls in FEV1 after exercise challenges. We hypothesize that the lack of difference seen in this study can be accounted for by more strenuous exercise efforts during the exercise challenges during screening and prior to randomization, but less strenuous efforts at the last post-treatment visit. We believe this may have occurred based on the heart rate recovery times observed over the course of the study. Heart rates at completion of exercise and change from pre-exercise were not different between groups, and were similar at screening, eligibility prior to randomization, and after four weeks of treatment. However, the recovery times observed were notably shorter after four weeks as compared to screening and pre-randomization. Thus, we believe subjects had a considerably reduced exercise load, i.e., were not “pushed as hard”, during the final exercise challenges and this contributed to the comparable results in the falls in post-treatment FEV1 seen with the two treatments. An alternative explanation for the improvement by FP in FEV1 attenuation following exercise challenge is that ICS adherence may have been inadequate prior to randomization. The protocol stipulated that subjects should have been using ICS for at least 4 weeks prior to screening. While a prescription or dispensing of an ICS can be documented, there is no method to confirm actual use of ICS. In addition, adherence studies confirm that on average, ICS adherence to prescribed use is less than 50% [19, 20]. If adherence to ICS continued to be sub-optimal during the run-in period, the screening exercise challenges would not reflect a population using ICS. Furthermore, it is known that adherence rates improve when randomized to study medication in a clinical trial . In addition, the current study was a relatively short-term study, which would also benefit adherence to study mediation, since adherence rates in clinical studies are negatively correlated to the length of the study [22, 23]. Thus, it is possible to surmise that the study population was reasonably controlled by ICS alone, but that the study did not adequately ensure appropriate use of ICS prior to randomization. However, adherence rates reported in the current study (assessed according to drug accountability conducted by the site personnel at each study visit) were >95% as determined during the treatment phase of the study for both groups. If the exercise challenges were not closely monitored and standardized during the study, or if ICS adherence prior to randomization was not adequate, then the study results are difficult to interpret. However, previous studies have shown LABA plus ICS to statistically significantly attenuate the fall in FEV1 compared with ICS alone for patients with chronic asthma and in whom symptoms are triggered by exercise [8, 9, 13]. Unlike the current study, a replicate study confirmed a statistically significant improvement in EIB protection in children and adolescents using FSC compared with FP . However, even in this study, questions were raised concerning adherence to study medications especially in the adolescent group which is known to be a high risk group for poor adherence. In summary, it is clear that both FSC 100/50 and FP 100 had a positive effect on attenuating the fall in FEV1 after exercise challenge in pediatric and adolescent subjects who required regular use of ICS for the treatment of persistent asthma. It is also clear that exercise studies represent unique challenges relative to standardization of exercise challenges and ensuring proper adherence to study medications. Therefore exercise studies must be carefully designed and closely monitored with consistent efforts produced to ensure that the test outcomes accurately inform on the defined objectives of the study. In this study, the full magnitude of the fall in FEV1 from what would have been expected appears to have been decreased by various study factors, and may have abrogated any difference produced by the treatment per se. 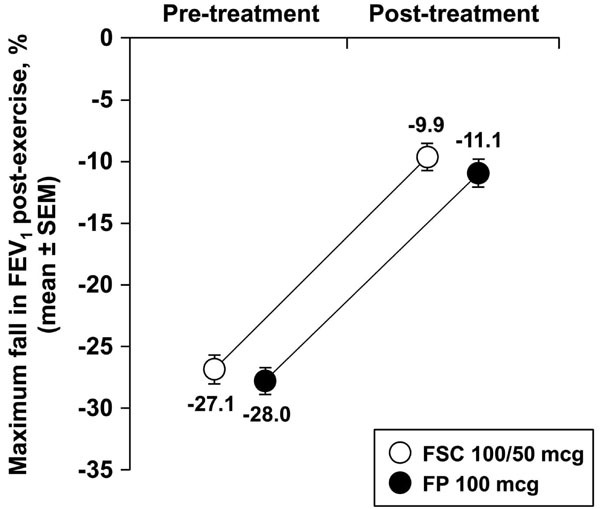 At the end of treatment, both FSC and FP protected against a fall in FEV1 following exercise in patients who at baseline experienced ≥20% fall in FEV1 following exercise. There was no significant difference between FSC 100/50 and FP 100 in the mean maximal percent fall in FEV1 at the exercise challenge test conducted following four weeks of treatment. The responses to other efficacy measures were comparable between treatments. Both study medications were well-tolerated over four weeks of treatment. FSC 100/50 had an adverse event profile comparable to that observed with FP 100 when used by subjects with persistent asthma who exhibit activity-induced bronchospasm. In some patients, therapy with FSC 100/50 may offer additional benefit if exercise-induced asthma symptoms are not adequately controlled with FP alone. Clinicaltrials.gov identifier NCT00118690. The protocol summary and results summary for this study (SFA100316) are also reported on the GlaxoSmithKline Clinical Trial register at http://gsk-clinicalstudyregister.com. Dr. Murray is a consultant and investigator for GlaxoSmithKline. Dr. Waitkus-Edwards and Mr. Yancey are employees of GlaxoSmithKline. The study was funded by GlaxoSmithKline. The authors would like to acknowledge Amanda Emmett, MS for her statistical analysis and expertise and critical review of the manuscript as well as Alan Kamada, PharmD and Laura Sutton, PharmD (all GlaxoSmithKline) for their editorial assistance in preparing the manuscript. National Institutes of Health - National Heart, Lung, and Blood Institute. Guidelines for the Diagnosis and Management of Asthma Expert Panel Report 2 1997. Lee TH, Anderson SD. Heterogeneity of mechanisms in exercise-induced asthma Thorax 1985; 40: 481-7. Bronsky EA, Pearlman DS, Pobiner BF, et al. Prevention of exercise-induced bronchospasm in pediatric asthma patients: a comparison of two salmeterol powder delivery devices Pediatrics 1999; 104: 501-6. Blake K, Pearlman DS, Scott C, et al. Prevention of exercise-induced bronchospasm in pediatric asthma patients: a comparison of salmeterol powder with albuterol Ann Allergy Asthma Immunol 1999; 82: 205-11. Vathenen AS, Knox AJ, Wisniewski A, Tattersfield AE. Effect of inhaled budesonide on bronchial reactivity to histamine, exercise, and eucapnic dry air hyperventilation in patients with asthma Thorax 1991; 46: 811-6. Freezer NJ, Croasdell H, Doull IJ, Holgate ST. Effect of regular inhaled beclomethasone on exercise and methacholine airway responses in school children with recurrent wheeze Eur Respir J 1995; 8: 1488-93. Kavuru M, Melamed J, Gross G, et al. Salmeterol and fluticasone propionate combined in a new powder inhalation device for the treatment of asthma: A randomized, double-blind, placebo-controlled trial J Allergy Clin Immunol 2000; 105: 1108-6. Nathan RA, Kalberg C, Jones S, et al. Effect of fluticasone propionate/salmeterol combination product on activity induced bronchospasm in patients with persistent asthma (abstract) J Allergy Clin Immunol 2002; 109: S236. Pearlman D, Qaqundah P, Matz J, et al. Fluticasone propionate/salmeterol and exercise-induced asthma in children with persistent asthma Pediatr Pulmonol 2009; 44: 429-35. Polgar G, Promadhat V. Pulmonary function testing in children: techniques and standards. Philadelphia: WB Saunders 1971. Food and Drug Administration Center for Drug Evaluation and Research (CDER), Guidance for Industry, Exercise-Induced Bronchospasm (EIB) - Development of Drugs to Prevent EIB Rockville: DRAFT GUIDANCE 2002. Vilsvik J, Ankerst J, Palmqvist M, et al. Protection against cold air and exercise-induced bronchoconstriction while on regular treatment with Oxis Respir Med 2001; 95: 484-90. Weiler JM, Nathan R, Rupp NT, et al. Effect of fluticasone/salmeterol administered via a single device on exercise-induced bronchospasm in patients with persistent asthma Ann Allergy Asthma Immunol 2005; 94: 65-72. Thio BJ, Slingerland GLM, Nagelkerke AF, et al. Effects of single-dose fluticasone on exercise-induced asthma in asthmatic children: A pilot study Pediatr Pulmonol 2001; 32: 115-21. Hosfstra WB, Neijens HJ, Duiverman EJ, et al. Dose-responses over time to inhaled fluticasone propionate treatment of exercise- and methacholine-induced bronchoconstriction in children with asthma Pediatr Pulmonol 2000; 29: 415-23. Fuhlbrigge AL, Guilbert T, Spahn J, Peden D, Davis K. The influence of variation in type and pattern of symptoms on assessment in pediatric asthma Pediatrics 2006; 118: 619-25. Carlsen K-H, Engh G, Mork M. Exercise-induced brochoconstriction depends on exercise load Respir Med 2000; 94: 750-5. Jones C, Santanello NC, Boccuzzi SJ, et al. Adherence to prescribed treatment for asthma: Evidence from pharmacy benefits data J Asthma 2003; 40: 93-101. Apter AJ, Reisine ST, Affleck G, Barrows E, ZuWallack RL. Adherence with twice-daily dosing of inhaled steroids: Socioeconomic and health-belief differences Am J Respir Crit Care Med 1998; 157: 1810-7. Boudes P. Drug compliance in therapeutic trials: a review Control Clin Trials 1998; 19: 257-68. Stephenson J, Rowe J, Haynes R, et al. Is this patient taking the treatment as prescribed? JAMA 1993; 269: 2779-81. Farmer KC, Jacobs EW, Phillips CR. Long-term patient compliance with prescribed regimens of calcium channel blockers Clin Ther 1994; 16: 316-26.